Everyone is always talking about the next Amazon. First there was Jet.com, which has so far failed to take off, then some nonsense about crowd-sourced retailing, and even Facebook has been bandied about as a possible rival. Now a a niche retailer named Wish thinks they're the next trillion dollar retailer. I paused for a beat to see if laughter was going to follow, but there was only silence. Alibaba launched in 1999, and its merchants did nearly $400 billion in sales in 2014. Amazon went live in 1995 and did an estimated $180 billion in gross merchandise volume in 2014. Wish? It only started selling goods in 2013 and just last year added other shopping apps like Geek and Mama that focus on specific product categories. And yet, the growth Szulczewski has managed in under three years has him spouting what many people probably think is nonsense. He doesn’t care. Szulczewski says merchants are on track to sell at least $2 billion of goods through Wish over the next year. To come up with that figure, you have to multiply monthly sales (minus returns) times 12. Put another way, Wish hasn’t actually booked $2 billion over the last year, but it could in the next 12 months. Szulczewski apparently thinks he's the next coming of Jeff Bezos, but that doesn't mean he's crazy, just that he has high hopes. People have been selling a variety of goods on Facebook since at least 2009, and the social network is taking steps to encourage merchants to set up shop, so Wish truly could become the next trillion dollar retailer - but I don't think they'll accomplish it on their own. Wish is a marketplace, and its ambitions are the natural extension of Facebook's own goals. And that is why I am expecting Wish to be acquired by Facebook. Once Wish proves it can attract both buyers and sellers, I bet the startup will get an offer it can't refuse: Either sell out to Facebook, or lose access to its main platform (another example of why one should always own one's platform). 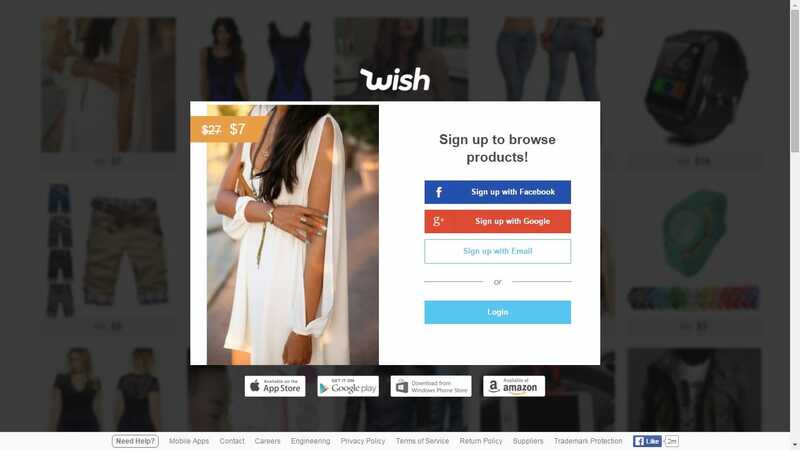 And who could blame Facebook for making the offer; if Wish truly does live up to its founder's dreams, the company would grow big enough that it could buy Facebook. A large part of the company’s early success is owed to deep-learning algorithms that decide which products to show to a user in the app, as well as in ads on Facebook and Instagram. Facebook’s ad team has been blown away by how much more sophisticated Wish is as an advertiser than literally any other company, according to multiple sources, thanks to the automated way in which it optimizes its ads and its use of every new ad product that Facebook releases. But of course that is all in the future; for now Wish still has to overcome many basic flaws. Wish's current MO is selling crap cheap by contracting with Chinese factories. As a result it has long ship times and a serious QA problem. According to re/code, it's not uncommon for Wish orders to arrive broken or in a wrong color or size, according to customer reviews. The company has in effect turned that model into an MVP, or minimum viable product/service. Is that product/service viable enough to become a trillion-dollar business? That remains to be seen. What do you think? Would you shop there? Have you shopped there? Tried to check it out, but it requires a sign up to even shop and see what they have. I broke down and logged in with my FB account. Oh, the site was fun and easy to use, but it was also too tempting to buy stuff on impulse. I don’t dare go back.